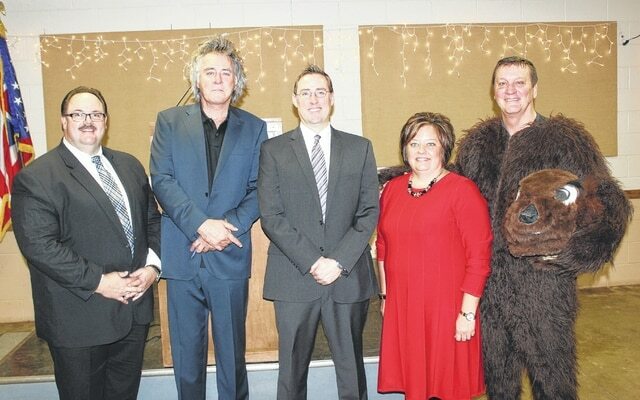 Drew Hastings lived up to his billing as “the most unlikely farmer and mayor you’ve ever met” Thursday morning by delighting a large crowd inside the Mahan Building at the Fayette County Chamber of Commerce’s fifth-annual Groundhog Day Breakfast. The City of Hillsboro mayor has been a well-known stand-up comedian for 20-plus years with comedy specials, “The Tonight Show” appearances and as a regular on the popular “Bob & Tom” radio show. Once a loft-living, city dweller, Hastings left Los Angeles at the age of 50 to take up farming in rural Ohio, where he has a cow/calf operation. As mayor, he was recently reelected to his second term. Hastings exhibited his comedic skills early and often during his keynote speech, and also offered some genuine insight into the challenges that cities such as Hillsboro and Washington C.H. are currently facing, as well as how to confront those challenges. “Yes, I’m a mayor and a farmer, but anybody who thinks that I actually have farming down pat, I can tell you it was just three months ago that I chased a newborn calf 300 yards across a pasture before I figured out that it was a black Hefty bag blowing across the field,” he said during his opening, which elicited uproarious laughter. Hastings described in detail how he came to this point in life after leaving Hollywood for the life of a farmer and mayor. From that point, Hastings said he took on what he thought were the biggest challenges facing Hillsboro at the time. Hastings said it was about two years of turbulent and “nasty” times before he could get the problem fixed. The condition and character of Hillsboro’s “uptown” has always been a primary concern for Hastings. Hastings also stressed the importance of creativity and finding ways to attract younger people to cities like Hillsboro and Washington C.H. Chad Gibson, senior planning officer for the City of Upper Arlington and an associated faculty member in the city and regional planning department at The Ohio State University, also spoke at Thursday’s breakfast. Gibson organized a group of 13 OSU graduate students who produced the “enVision Fayette County plan,” the first update to the county’s comprehensive land use plan since its inception in 2006. Look for more on Gibson’s presentation and the enVision Fayette County plan in a future edition of the Record-Herald. Whitney Gentry, president of the Fayette County Chamber of Commerce, provided the opening and closing comments, the Fayette County Honor Guard made the presentation of colors, the prayer was given by Fayette Bible Church Pastor Tony Garren, and the breakfast was provided by The Willow Catering. Dan Roberts, former Miami Trace Superintendent and current member of the Fayette County Board of Elections, was revealed as the “celebrity groundhog” at the end of the program. The groundhog breakfast was created five years ago in order for attendees to learn more about the county’s business and economic forecast while having a little fun as well. Once again this year, McDonald’s of Fayette County served as the corporate sponsor for the event.